Peritoneoscope (synonym laparoscopy) is a method of exploring the outer surface of the abdominal cavity by means of an optical instrument (endoscope), entered through an incision in the abdominal wall. Shows peritoneoscope to clarify the nature and localization of diseases and injuries of the organs of the abdominal cavity. If peritoneoscopy you can perform a biopsy (see), color photography, with the end of the tool to determine the density of the studied education. For the production of peritoneoscopy usually use thoracoscope, although there are similar tools (especially for peritoneoscopy - laparoscopes). Sterilization is performed according to the rules common for endoscopic instruments (see the Thoracoscopy). Before peritoneoscopy into the abdominal cavity of the patient is injected gas (see Pneumoperitoneum). 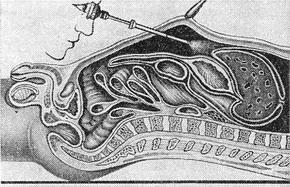 Peritoneoscopy. The abdominal wall is raised in the umbilicus; through the cone of trocar entered the optical system. Peritoneoscope is a surgeon in a hospital in net operating. Nurse or medical assistant prepares the patient and the necessary equipment for investigation, assisted during it and monitors the patient. The night before peritoneoscopy patient undergoes a cleansing enema, inside are teminal-sodium (Nembutal), or phenobarbital (luminal) in the dose of 0.1 g Morning for 30 minutes before peritoneoscopy injected subcutaneously to 1 ml of the solution of atropine sulfate (1 : 1000) and promedol (2%). The bladder empty catheter. Patient is placed on the operating table on his back. The operating field and hand surgeon process, as for abdominal surgery. To expand the space between the abdominal wall and abdominal patient impose pneumoperitoneum. The introduction of a laparoscope is determined depending on the intended localization painful process; most safe introduction in the point above the navel and 2 cm to the left from the middle line or over the white line of the abdomen below the navel. Under local anaesthesia, 0.5% solution novokaina (with indications it is under General anesthesia) scalpel make the incision of the skin with a length of 1 cm and through him, lifting the abdominal wall, injected trocar laparoscope, extract the stiletto and instead inserted into the tube optical system (Fig. ). For inspection bodies upper abdomen, lower the foot end of the table, for seeing the area blind gut patient turn on your left side. At the end of peritoneoscopy air from the abdominal cavity released through the tube of a laparoscope, a recent extract and skin impose silk suture. Contraindications to peritoneoscopy: cardiovascular failure, hemorrhagic diathesis, active tuberculosis lungs, expressed obesity, pustular skin diseases of the abdominal wall. Possible complications: intra-abdominal bleeding due to damage of blood vessels of the abdominal wall, the mesentery of the intestine or parenchymatous organs, wounds of hollow organs of the abdomen, subcutaneous emphysema.